Online engagement by Internet users is deepening. This increased engagement is in part a result of a shift toward video content and social networking as popular online subcategories. The number of American users frequenting online video destinations has climbed 339 percent since 2003. Time spent on video sites has shot up almost 2,000 percent over the same period. In the last year alone, unique viewers of online video grew 10 percent, the number of streams grew 41 percent, the streams per user grew 27 percent and the total minutes engaged with online video grew 71 percent. There are 87 percent more online social media users now than in 2003, with 883 percent more time devoted to those sites. In the last year alone, time spent on social networking sites has surged 73 percent. In February, social network usage exceeded Web-based e-mail usage for the first time. CM Comment: The momentum for legalizing Internet gambling in the U.S. seems to be building. April 27, 2009: summarized from The New York Times -- When the U.S. Congress cracked down on Internet betting in 2006, the big, publicly traded European companies that had dominated the business closed up shop in the United States. Growth in the booming industry shifted away from these companies, once the darlings of the stock market, to private operators in offshore locations like Antigua and the Isle of Man. But now, executives of some of the European companies whisper excitedly that they may soon get a second chance in the United States. Meanwhile, a number of European countries that have long maintained barriers are moving, under pressure from regulators, to legalize, and tax, online gambling. The biggest potential change would be in the United States, where, perhaps within days, Representative Barney Frank, Democrat of Massachusetts, is expected to introduce legislation aimed at overturning the Unlawful Internet Gambling Enforcement Act. Mr. Frank tried and failed to do so once before, in 2007. But advocates of liberalization think they might get a friendlier hearing in Washington this time around. President Barack Obama, they note, boasted of his poker prowess during the election campaign. And the Democrats, who are seen as less hostile to Internet gambling than the Republicans, have tightened their grip on Congress. Since the 2006 law was passed, North America, once the biggest market, has been passed by Europe and Asia, according to figures from H2 Gambling Capital. The law makes it illegal for financial institutions to handle payments to online gambling sites. But enough people have found ways around it, some by using overseas payment processors, to ensure that online gambling remains a thriving business. H2 says online gambling generated revenue of $6 billion last year in North America, more than a quarter the global total of $22.6 billion, up from $17.6 billion in 2006. Pulling out of the United States cost PartyGaming about three-quarters of its business. 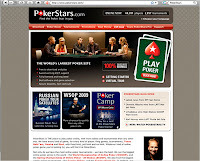 Its position as the biggest online poker provider has been taken over by PokerStars, a privately held operator based on the Isle of Man. This month, PartyGaming agreed to a $105 million settlement with the U.S.
attorney's office in New York, involving the period before 2006, when it acknowledged that its activities had been "contrary to certain U.S. laws." In turn, the U.S. authorities agreed not to prosecute the company, which is listed on the London Stock Exchange, or its executives. The agreement fueled speculation that PartyGaming might be trying to position itself for a return to the U.S. market, if online gambling were legalized. Analysts say one possibility for European companies like PartyGaming, should the ban be lifted, would be to form partnerships with American casino operators. That would allow the European companies to share their online expertise. Operating alone, they might struggle to obtain licenses, given their history of run-ins with U.S. law enforcement, analysts said. So far, Las Vegas executives have maintained a cautious stance about legalization of online gambling. Steve Wynn, chief executive of Wynn Resorts, said in an e-mail message that he thought it would be "impossible to regulate." "Even though it would be a benefit to our company, we are strongly opposed," he said. But speculation that Las Vegas casino operators were looking into the possibilities was fueled by recent reports that Harrah's Entertainment, which owns Caesars Palace and other casinos, recently hired Mitch Garber, former chief executive of PartyGaming, for an unspecified role. Harrah's did not return calls. Mr. Ryan said that PartyGaming planned to focus on acquisition opportunities to increase its market share in Europe and elsewhere, something that was difficult as long as investors were worried about the U.S. litigation. "We think Mr. Frank's efforts are quite meaningful to the sector," he said. CM Comment: Some data that ranks household penetration of casino loyalty programs versus other industry segments. April 22, 2009: summarized from Promo -- The good news is that people are joining loyalty programs in pretty big numbers, seeking added value in a tough economy. The bad news is that activity remains flat with two years ago. The take away: marketers need to shift focus from growing membership to increasing the value of the programs. Membership in U.S. loyalty rewards programs jumped 24% to 1.8 billion, from 1.3 billion two years ago, according to the 2009 Colloquy Loyalty Census. The average U.S. household signed up for 14.1 loyalty programs, but actively participates in only 6.2. The corresponding numbers in 2007 were 12 and 4.7. The number of active memberships-a member with at least one instance of activity in a 12-month period-is 792.8 million or 43.8%, compared to 39.5% in 2007. Financial services took over the top spot from airlines, after seeing a 77% increase in credit and debit reward card program memberships in just two years. The growth was fueled by the dramatic expansion in consumer credit. The 2009 census is based on information from Colloquy's archives, program Web sites, sponsor-company press releases, annual report filings, third party publications and research reports. CM Comment: Worth noting the various mobile marketing ideas included in this article. April 24, 2009: summarized from Adotas -- Even in a down economy, people's desire to communicate seems to be unquenchable. As marketers plan their engagement marketing strategies for the rest of the year, they should consider these important trends. Text Messaging Surpasses Monthly Mobile Phone Calling: A recent Nielson study found that texting is now more popular than calling someone on your mobile phone. The tipping point seemed to come in Q3 of last year, when it was reported that 202 million of 263 million American wireless subscribers were now paying for text messaging either as part of a package or on a transaction basis. Customers are More Mobile than Ever Before: Wireless subscribers in the U.S now represent about 84 percent of the U.S. population. We are talking on our mobile phones over 1.22 trillion minutes per year, according to Nielsen. Annually we are text messaging each other over 600 billion times. Another key trend we are seeing is the rise in wireless-only households, which currently represents 15.8 percent of U.S. homes. Special Text Offers - Text special offer codes to mobile customers and prospects. Mobile-to-Web Links - Add links in your text marketing to drive visitors to your mobile website content. Mobile Search; Advertising - Experiment with mobile search marketing that is local and location based. Mobile Loyalty points program - Credited through mobile devices at point of sale. Mobile Coupons - delivered to mobile users at point of sale. Add Mobile to all Campaigns - Incorporate your text campaigns into all of your marketing channels for instant engagement. Text-to-Win campaigns- Text now for a possibility of instant prizes - Builds your SMS marketing database quickly. Free Mobile Content - Attract mobile consumers with free content such as real estate property listing information available on your phone while you are sitting in your car in front of the property. Free Mobile Web applications - customized to the mobile user for maps, directions, traffic reports, weather, sports scores, stock quotes, etc. (best if used for dynamic content). Mobile Commerce is coming: Google, Yahoo!, AOL and PayPal are all launching transaction services via mobile. In Japan and other international markets, mobile phones are already enabled to conduct commercial transactions replacing the need to carry your credit cards. So expect to see financial services solutions, sporting events, travel, event ticketing, and in-store point of sales promotions to become common in the coming years. April 22, 2009: summarized from Vator News -- Internet engagement is increasing every year. This is due to the fact that social media and online video consumption are becoming a part of our every day lives. In a report released by the Nielsen Company today, we see clearly how these forms of online content have reshaped the Internet. There are 87 percent more online social media users now than in 2003, with 883 percent more time devoted to those sites. In the last year alone, time spent on social networking sites has surged 73 percent. Also included in the report is an interesting exhibit which takes a look at the relative "buzz", or online conversations, between the three biggest social networking sites: MySpace, Facebook and Twitter. Twitter surpassed Facebook in March of this year and appears to be stretching ahead. MySpace seems to have fallen significantly since February of this year.